In Burlington County, there are a number of places that claim to have the best wings, and one of them is known as Dadz Bar & Grill. Located on the corner of Main and Rt. 38, this bar gets a lot of exposure and I’m sure it gets packed during the night time hours. With Pong tournaments, a pool table, and Happy Hour 50¢ wings, how can you not see a crowd coming? On Tuesdays they have all you can eat wings for under $10, and it lasts for 12 hours. So if you have nowhere else to be with a good pocket of beer-cash, you can have a great day. But unfortunately for me, it is not Tuesday… and yet I was still craving wings. So, I cracked open the menu to see what wing variations they had to offer. The wings come in increments of 6 with a variety of heat levels including Mild, Medium, Hot, Super Hot, and Hotter Than Hell. They are served with celery and carrots, but if you want blue cheese be prepared to pay extra. The wings come lightly breaded or you can order them Naked, and Dadz even offers the ability to get just drums or wings for an extra fee. I thought that was pretty cool because I personally like the wingettes better, and to have an entire plate of that would be like eating just the muffin tops. I ordered up a twelve count with Hot and a side of both the Super Hot and the Hotter Than Hell sauces to see how they measured up. They even have a contest where if you can eat twelve of their Hotter Than Hell wings you get a free t-shirt. I’m not one for those types of challenges but this one I actually considered, ’cause hey… free clothes. The wings came out and I realized that I forgot to order them Naked (I tend not to get wings breaded, if there is an option, because I find that a lot of the time the breading gets soggy and it is not as enjoyable to eat). I’m kind of glad that I messed up this time because the wings were actually breaded nice and light which gave a good crisp to the skin. They serve the wings and drums apart, but the tips were still left on the wings for you guys who like to gnaw on that part. The meat was pretty tender which made it easy to break the bones apart, but the chicken didn’t really carry much flavor other than the flavor it got from the hot sauce. The sauce was poured nicely over the entire bowl of wings and collected into a calm pool on the bottom of the bowl for extra dipping. I love this because I always find myself asking for extra sauce just to complete my meal. The Hot sauce tasted pretty good and had some really good heat to it, but smacked my tongue aggressively. There are two kinds of heat when eating wings – one that you feel immediately on your lips and tongue, and the other which skips that part and sneaks up on the back of the throat. This sauce didn’t do anything to my throat but resonated on my tongue with a sharp heat that made me slow down my eating as I felt myself scraping my taste buds with my teeth like a squeegee. Not because it was hot, but because it had a very acidic sting to it. I passed on the vegetables, because they looked disgusting, and went right to the fries to give my taste buds a break for a moment while I got ready to taste the alternate sauces. The Super Hot seemed like they stepped up the Hot sauce by adding some Habanero, and the Hotter Than Hell did the same by taking the Super Hot and adding some more peppers along with an extract to crank up the heat. So if you are into really hot sauces, then Dadz will not disappoint. But again it’s the “stab your tongue” heat, so be ready. When it all comes down to it, Dadz Bar & Grill has some pretty tasty wings. They are one of the places that market “Jumbo” wings and actually GIVES you “Jumbo” wings. 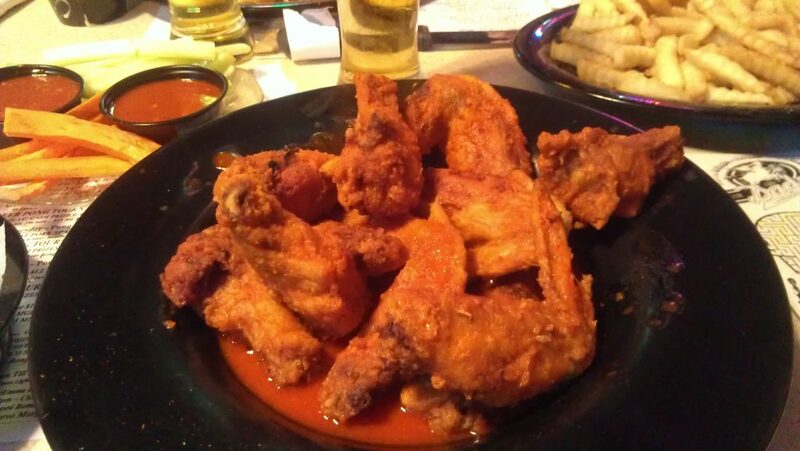 The sauces had very good heat and the meat was nice and tender, but I don’t feel like it had as much flavor that one needs to earn the title “Best Wings in Burlington County.” Especially when Burlington County is pretty big and if memory serves, is also home to John & Molly’s.